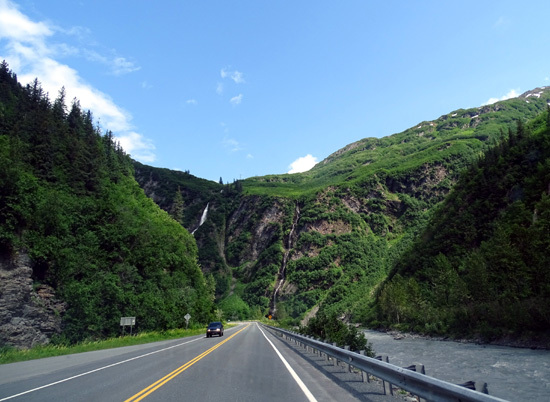 greet you from towering canyon walls just before entering Valdez." 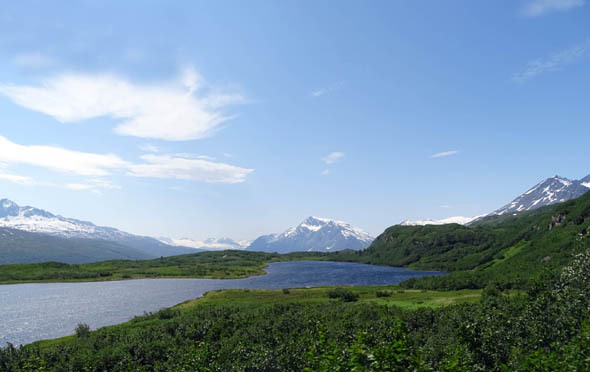 Most of the five-and-a-half days we've been in Valdez have been relatively warm and sunny, perfect for our hikes, bike rides, and sight-seeing adventures. Friday was no different. 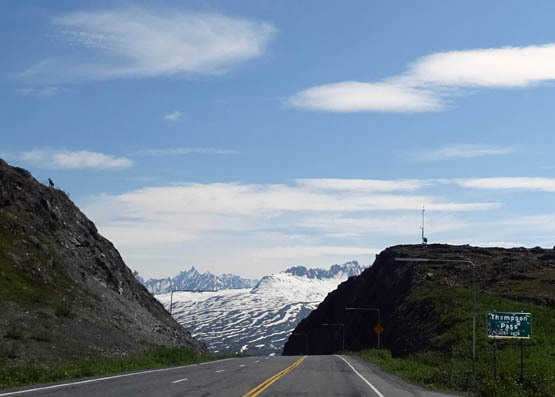 Clouds moved in and out during the day -- typical for coastal Alaska -- but we had plenty of sunshine and time for long bike rides in the morning and a fun road trip to Worthington Glacier and back in the afternoon. This close to the summer solstice, daylight is very, very long so visitors can pack a lot into one day. 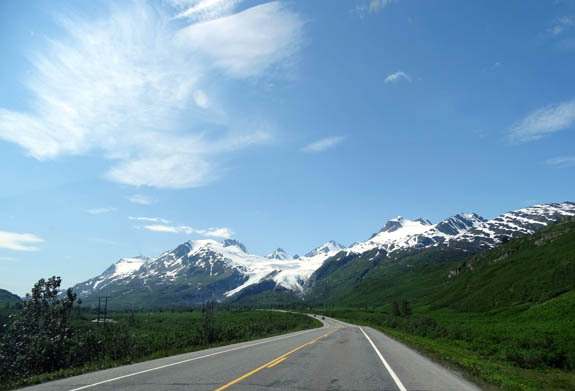 The sky was mostly blue when we reached Keystone Canyon about twelve miles northeast of Valdez. 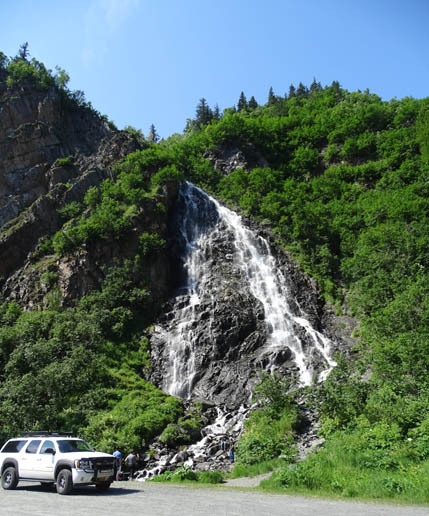 I got some good pictures of waterfalls, mountains, glaciers, lakes, and other scenery and we met an interesting full-time RV couple, Chuck and Jodie. They sold their house in Maine five years ago and love their carefree lifestyle traveling around North America. 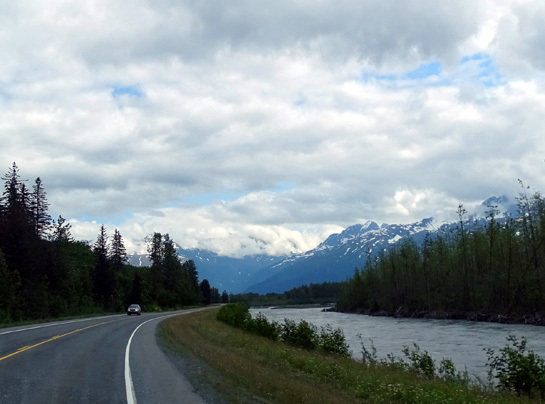 Keystone Canyon and the glacier-blue Lowe River; wonder how often the highway floods in the spring?? When we saw the couple we'd just driven north through most of Keystone Canyon, formed over the millennia by the Lowe River. 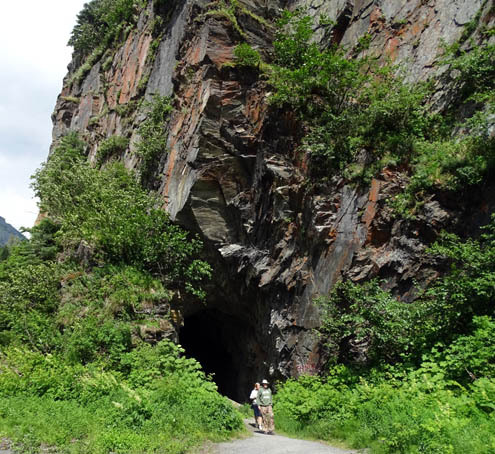 This tunnel was hand cut into the solid rock of Keystone Canyon and is all that is left of the railroad era when nine companies fought to take advantage of the short route from the coast to the copper country. However, a feud interrupted progress. 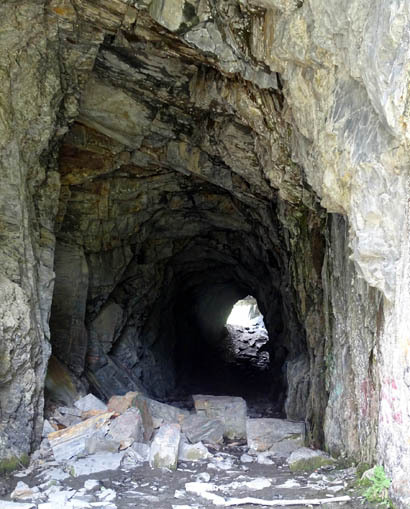 A gun battle was fought and the tunnel was never finished." That's where we met Chuck and Jodie, who were investigating the tunnel when we arrived. We'd seen their truck camper in town about an hour earlier and remembered their distinctive personalized South Dakota license plate. We began talking and spent about 30 minutes with them. To our surprise we discovered that they also have a 2012 Cameo 35SB3, the same model as ours but two years newer. They purchased it three months before Carriage went bust. 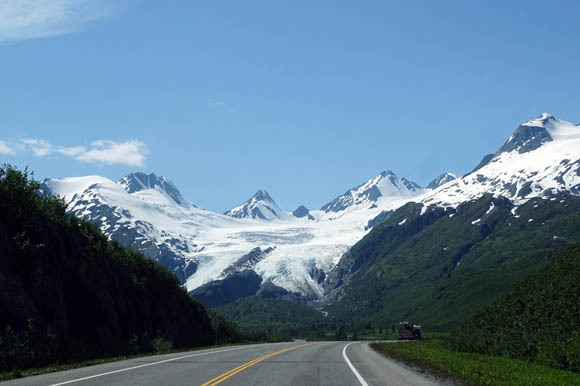 They left the Cameo in Florida in storage and bought the Adventurer truck camper for this trip to Alaska. The truck camper has two slide outs. Chuck and Jodie love it and proudly showed us around inside. It has a kitchen in the back slide. The other slide expands their living area. We have heard of other couples who have done this, too. 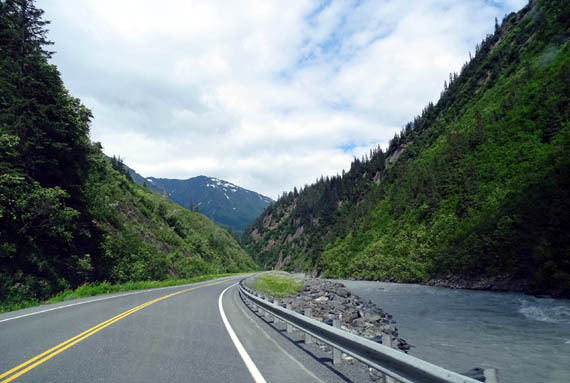 The smaller RV gets better MPG and camping options are almost limitless. 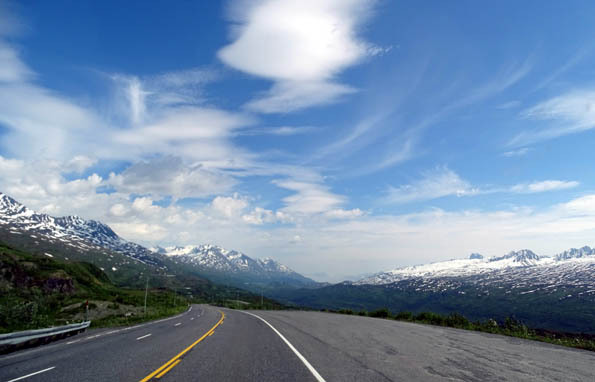 We considered doing the same thing three years ago -- purchasing a truck camper for the trip to Alaska, storing the Cameo, then selling the truck camper when we got back to the Lower 48. We didn't have any trouble with the Cameo on the long drive, however, and we usually found suitable campsites for our 36-foot 5th-wheel. So we just brought the Cameo with us again this trip. Although this couple thinks the truck camper has plenty of room for them and their large standard poodle, Jim and I know we would get claustrophobic pretty fast. After living in it for four or five months and 15,000 miles of travel, Chuck and Jodie might think so, too! Still, it has us thinking about this option again when we need a new truck (a large truck camper like this needs a one-ton dually). Camper tops are getting larger and more sophisticated than they used to be. 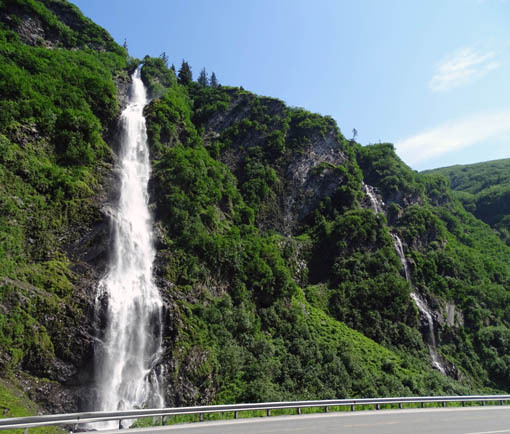 They are practical on a long trip like Alaska but to us, having two RVs would be almost the same as having a house or condo somewhere. The couple will be in Alaska all summer so we may run into them again. 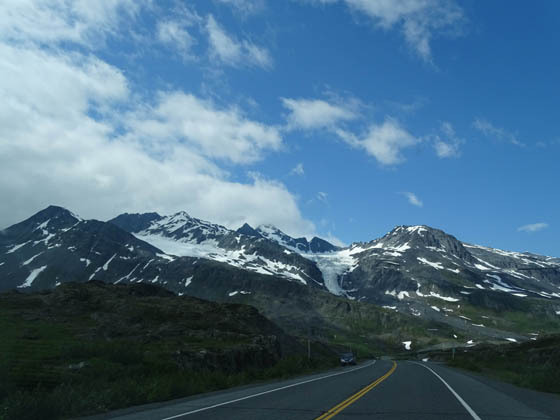 They were on their way north a few miles, spending the night boondocking between Thompson Pass and Worthington Glacier. 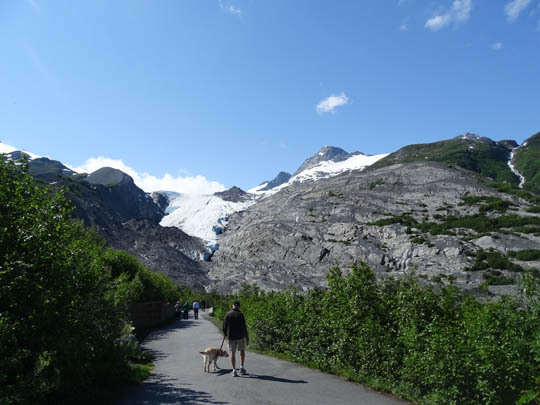 After we investigated the old railroad tunnel we continued driving up and over Thompson Pass to Worthington Glacier. 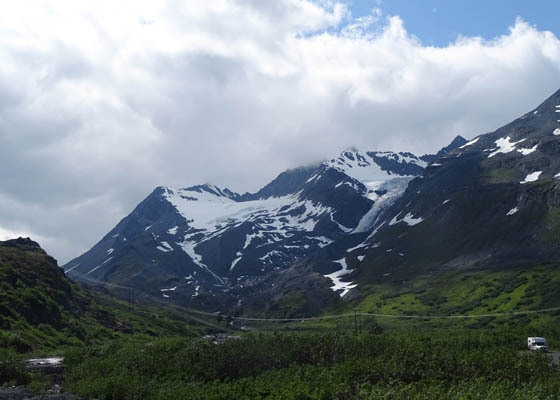 Despite its relatively low elevation of 2,678 feet, Thompson Pass is above treeline and has probably the highest recorded amount of snow in Alaska since official records have been kept. During the winter season of 1952-53 the National Climactic Center's station at the pass recorded a whopping 974.5 inches of snow! That February alone, 298 inches of new snow were recorded. 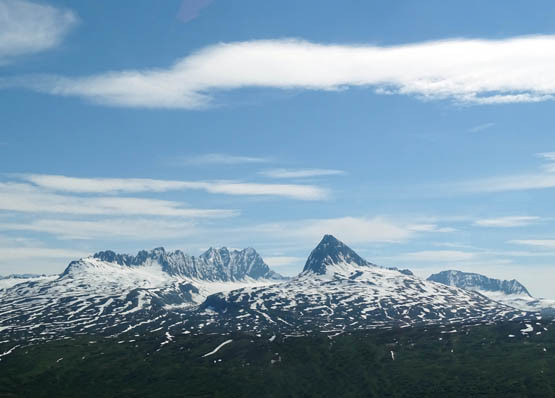 I don't know how much snow fell the winter season of 2011-12, when Southcentral Alaska reportedly got more snow than ever, because there was no longer a station officially recording the snowfall there. That's too bad, because the depth might have been even more. 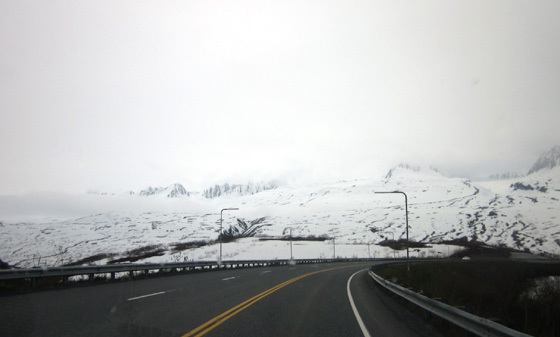 Note that Valdez, dubbed "American's Snowiest City," has an annual average of 326 inches of snow. Average. Obviously, some years they get even more. 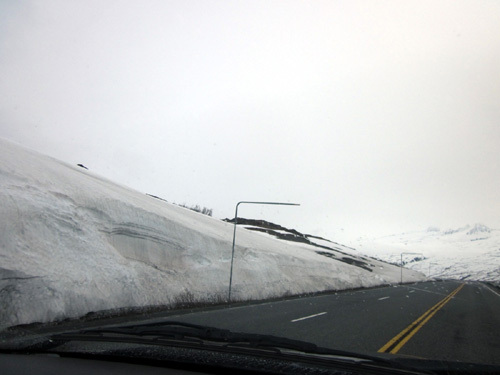 When we passed the glacier on our way to Valdez several days ago we could see the ground! 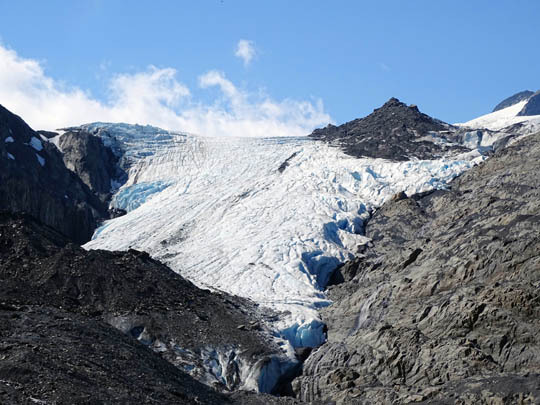 We knew we wanted to come back to see the glacier close up. 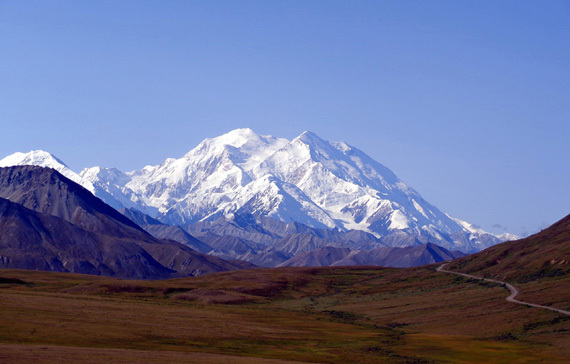 The good news is, there is no fee to visit this National Natural Landmark. The bad news? Because it's so accessible, it gets a lot of visitors. Fortunately, when we arrived on a weekday there was just one Class C motorhome and a tour bus in the large parking area. Most of the older folks on the bus were done sight-seeing and on their way back to their seats. Some enjoyed petting our dogs. Since leashed dogs are allowed here, we took Cody and Casey on the quarter-mile paved walk to the observation deck. 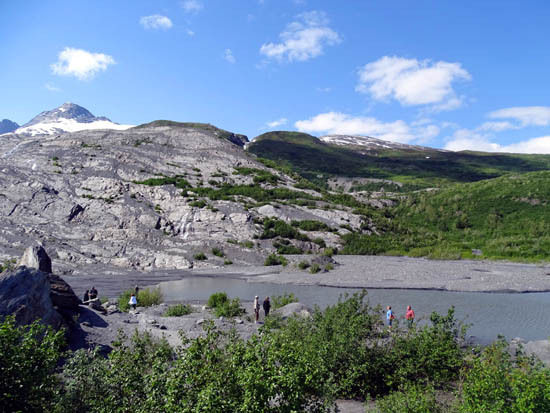 We decided not to walk down closer to the foot of the glacier but we could have done that. However, because of the danger, visitors aren't allowed onto the ice itself. 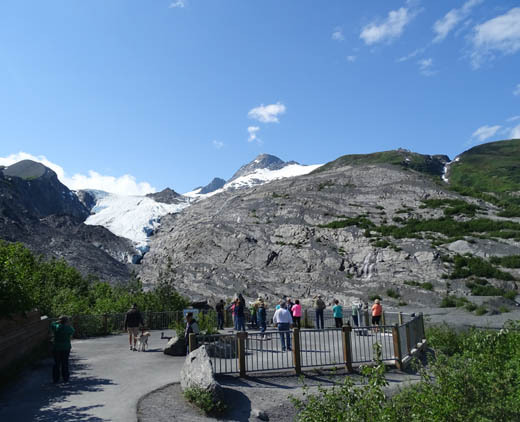 Worthington Glacier is not as large as Exit Glacier in Seward, or some other nearby glaciers. It's just more accessible. 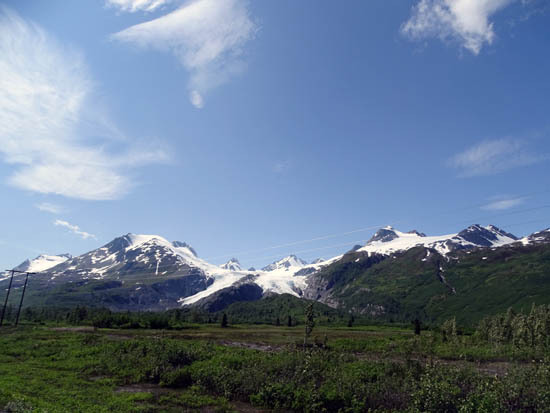 Like most Alaskan glaciers, Worthington has significantly retreated in the last century. 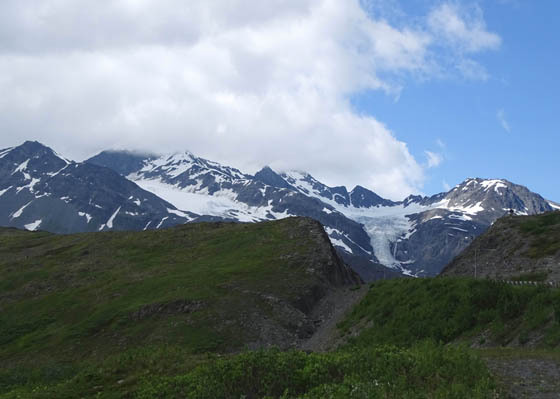 On the way back down to Valdez from Thompson Pass we stopped several times to view the awesome mountains and glaciers above Keystone Canyon . . .
Blueberry Lake now; three years ago on this date it was surrounded by snow. 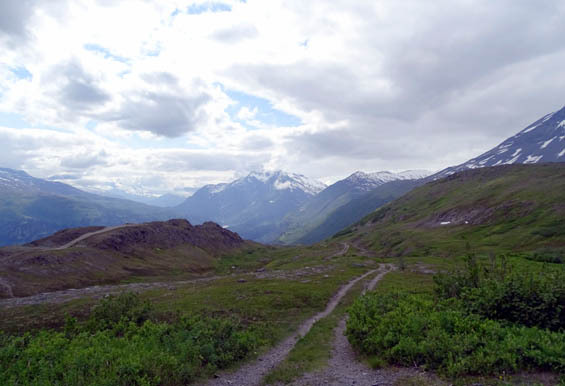 Blueberry Lake State Recreation Site lies just below Thompson Pass. 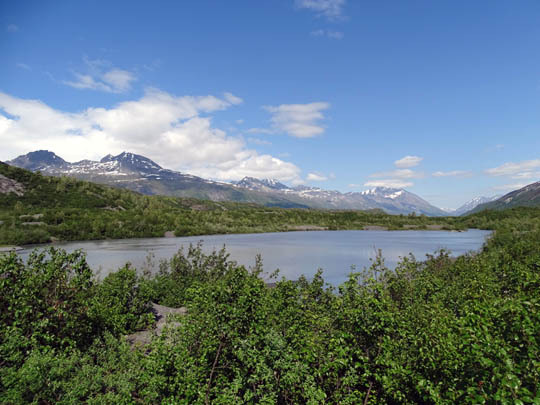 The lake and campground are surrounded by tall Chugach Mountain peaks and colorful wildflower meadows. 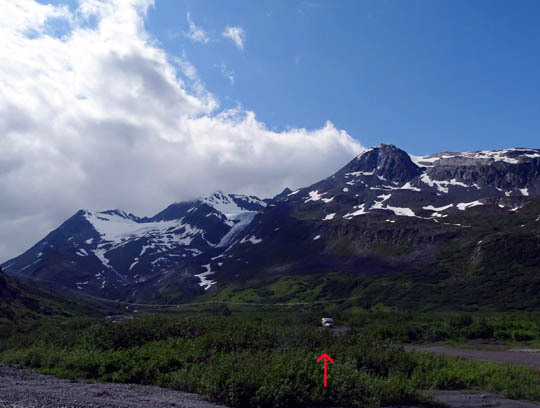 I can't imagine a more beautiful setting to camp but the sites are small and the season is very short. Even in the summer it's quite chilly and windy here. 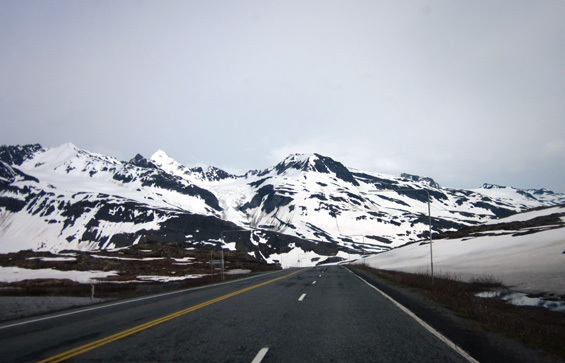 For more photos of the glacier, pass, and canyon see the June 17 entry. This is my last entry for Valdez. Because we had warmer, more sunny weather we enjoyed staying here more this summer than three years ago. 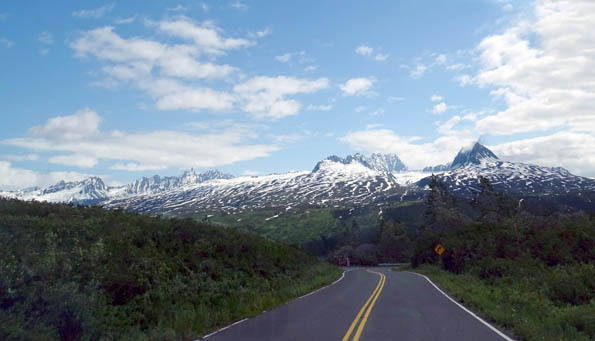 If we ever come back to Alaska a third time, I will want to visit Valdez again -- but only when it's not covered in snow!